Wow. Post-long weekend craziness at work meant that despite my best intentions I didn’t make Tuesday training this week. I was at my desk working away when I realised time had gotten away from me and it was too late for me to make training. Very sad! Still, next week should get easier – when daylight savings starts the pool will open later and the training timetable will be changing to include a later session on Tuesdays that will make getting there a lot easier. Wednesday, though, I made sure I got there. I can’t say I had the best attitude about it as the long weekend work fallout was continuing, and I had a super-sore calf muscle (result of a nasty cramp while diving over the long weekend), but I always convince myself to go anyway with the logic that a half-assed workout is still better than no workout at all. I may have been a bit slack on my tumble-turn resolution, though…I tried the first couple of laps, but there were several of us in the lane swimming very similar paces, and my turns are still somewhat lacking in coordination. After nearly taking out other swimmers a couple of times I decided to give it a rest tonight and focus on the main set. A concerted effort will be made next week to get back on track! Wednesday training this week was a far more successful outing than Tuesday’s failed attempt at cheesecake redemption! Coach Kingy was back on deck and so was the pacing training at the new and improved (read: harder) time. All at a consistent pace. Obviously this set can be dialled up and down depending on how much time you have and how fast the swimmers are and if you’re doing drills as well. It’s a good one at really learning to maintain that pace we’ve been working on over longer and varying distances. In an ocean swim, you don’t have that neat end of each pool to tell you when you hit 100m, so it’s good to know what that pace feels like over different distances. It’s also a good one for developing stamina and endurance and I know my arms were feeling it by the end! Allison was back from what sounded like a brilliant swim tour in Fiji and it seems we’ve hit a point where we’re swimming almost exactly the same pace, so we stuck together and switched up leading a bit (I’d like to point out that I bravely took the 400m leg!). I do love having someone to pace off, both at training and in races, so it was nice to find and stick with a buddy and I was pretty happy with the pace we maintained. On another note…bet you’re wondering if I faced my fears and tumble turned after last week’s master class. Well, good news…I did! I decided to make myself do it at the deep end turns only, to start with. I kept it up most of the way, although I found as I got tired towards the end of the set I started to go a bit wonky and became a bit of a danger to myself and other swimmers. Oops! At that point I eased up a bit, but will keep at it until I can get in more per set, faster and better. Wednesday Training – 5th September – Time Trial! Last night’s training was the big day of reckoning – us against the clock! 5 weeks had elapsed since the last time trial and the squad had been doing the extra 4Ts Tuesdays and working on pacing for weeks now to improve times. I, only the other hand, started strong, but had that horrid cold and did my dive course and have been kind of all over the place with my training. I worked from home yesterday, so I drove down to the pool. It’s closer to my house than my office, so I was there plenty early. It was a particularly gorgeous day yesterday and the sun was shining and it was balmy warm, so I had a bit of a wander in the park as the sun was setting and that helped with the nerves. We did a warm up and a 3-5-7 breathing drill to get our arms warmed up and turning over. Despite my reservations I was feeling pretty good in the pool. I’d had a very early (alcohol free) night the night before, eaten thoughtfully through the day and I think that helped. We did a 200m as timed 50m sets on our pace with 15 seconds rest in between. It wasn’t taxing at all, but it was good for me to get that feel for how fast I should be going out at the start. Then we started the time trial. 500 metres, same as last time. I continued on, keeping to my pace. To my surprise I was feeling good. Very good. At about half way through I surprised myself by catching up to Leanne, who was swimming in front of me and had started 10 seconds earlier. I used her to pace myself for about 100m as I know we swam a pretty similar time trial last time and that she’s been a touch quicker than me in the pool lately. I was feeling like I could overtake, but didn’t want to go out too hard too soon and leave myself with nothing for the finish. I wanted to trust in all the pacing work we’d done! Then , just as we were heading in for the 2nd last turn, I knew I could ramp it up the rest of the way. The leader in our lane came from behind and passed the both of us, so I took the opportunity and jumped on her feet for a tiny boost and overtook! The next 100m I ramped up to 90% effort and I had a good feeling, then on the home stretch with about 20m to go I really went into overdrive!!!! I was focussing on keeping technique and getting enough oxygen and turning the arms over as fast as I could! I hit the wall and Coach Kingy noted my time. There was a bit of confusion since we needed to adjust for staggered start times and I get very bad at basic maths when I’m tired. But I had dropped a full 30 seconds from my last time!!!!! I was both floored and ecstatic with that result! Near as I can tell there are a couple of reasons why the improvement was so massive. I think I must have had a bad swim last time trial. Compared to other time trials I’ve done it was slow. The change in strategy definitely helped. Keeping a consistent pace and then finishing strong is, intellectually, a better idea than killing yourself on the first hundred and dying for the rest. I’m so trying this out this race season. The coaching and training sessions definitely helped. I may not have made all of them, but I’ve been pretty active (apart from when I was sick) and it all helps with general fitness. Knowing the time trial was coming meant I could prepare physically by not coming stressed and rushed from the office, make sure I didn’t do anything silly the night before and could make certain I was eating well and hydrating on the day. Afterwards we did a bit of a swim down and then the coaches gave us an early mark so we hopped out and showered and changed and all went out for dinner and wines! 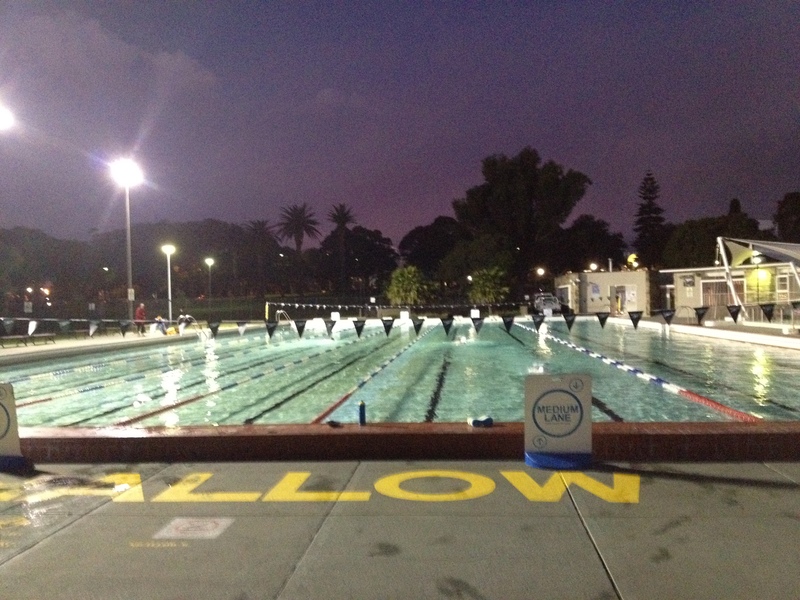 Wednesday was my now-usual pool training session at Victoria Park. I worked from home on Wednesday, so and decided to drive down instead of ride so I was there early for a change…and managed to snap a pic. The days are also starting to get a fraction longer, so there was a touch of purple in the sky still. The air was plenty chilly but still and clear. The crew rocked up and we started with a warm-up. We followed up with two drills and two variations each. Second drill was a high elbows/finger drag drill. Both of these exaggerate the arm movements. This works on making good arm technique feel natural, and also helps with body rotation. I don’t mind these ones as in general they aren’t too far from swimming normally. They don’t feel too weird, uncoordinated or uncomfortable like some drills can. We did a bit of a high-heart rate lead up to the main event…the dreaded TIME TRIAL! A time trial is a set distance, usually done under controlled conditions like a pool, at regular intervals during your training to monitor progress. Ideally, any training program is designed so that you should see improvements or hold steady at your time. The bad news is that a time trial is hard work! You want to get the best time possible, so that means swimming hard for the whole distance. In reality, for me at least, there are times when I’m training hard with a goal in mind, giving up a lot of things that are bad for me, and really focussed on swimming, In race season, when I’m doing timed swims almost every weekend, I am also pretty settled into the pace of a race and what I need to do and how I need to be thinking to do my best times. Under those conditions I can usually manage consistently improving times. occasionally having to give time and attention to other things. Like work (sigh), family, friends and significant others. So it seems the world is full of great excuses. And a good time trial every now and then can keep you on track. 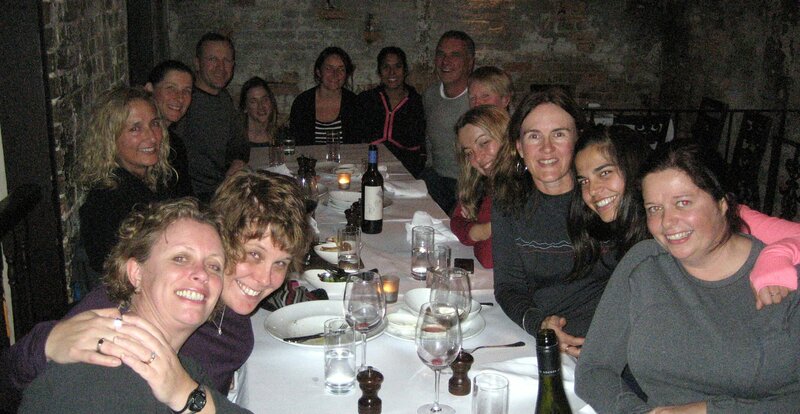 If you happen to have stumbled here without knowing me already, that’s me with the bad post-swim hair, 2nd from the front on the left. Wedensday night it was off to Victoria Park pool for another Wednesday training session. Despite struggling a bit for the session, it was quite an interesting one. I was running pretty late and coach Zoe was talking to a walk-up who was obviously interested in joining, so I hopped in with the rest of the group who were already swimming and did a warm-up. I think the rest of the group were doing a different drill while I did that, but I checked in and started on a one-arm drill. This is a good one for building strength, and working on rotation and stability. There are a few variations, but we did one arm out in front (4 o’clock position so ahead but slightly below the water line) and breathing every one or two strokes. Up 50m one arm, then returning 50m the other arm. The main set was alternating distances hard then easy. This is good for ocean swimmers to learn to push through and swim hard to get through the break, and then do an active recovery to settle into a pace for the rest of the race. At the end of the session, Zoe had us do a fun exercise…each person to take off and swim as far as possible without taking a breath..then move to the side of the pool to see who made it the furthest. I was a bit concerned given my past as a dirty smoker, but was actually quite happy with how far I managed to get. I suspect it may have had more to do with stubbornness than lung capacity, though. Last night I headed off from work to training. I really struggled…I had a hard time getting away from work on time, there was a bus breakdown on the way that made me late, I was stressed and tired and feeling generally a bit rubbish. By the time I got anywhere near the pool I seriously considered turning left instead of right and going straight home. Usually when that happens I’m fine once I get there and get in the water, but occasionally that doesn’t happen. I hopped in and started my warm-up. My shoulder was sore and I just couldn’t get into a rhythm the whole set. I was swimming slower than usual and the voice in my head was feeding me some very negative thoughts. Swimming, at the end of the day, can be a very solitary sport. It’s pretty social before and after and when regrouping and sometimes at the ends of the lane, but while you’re actually doing the swimming part of it, you’d better get to know the voice inside your head pretty well because that’s all you’ll have for company out there. And my particular inner voice runs a very steady internal monologue. It’s a bit of a roller coaster for me too, usually. At least once every race I wonder what the hell I’m doing there. I hate the sport and should just hitch a ride back to the beach. Something hurts and it’s too hard and what was I thinking in the first place imagining I could do this stupid thing. Luckily at least once I realise how much I love doing this. It’s heaps of fun and I see something new and I feel good and I feel strong and just focus on technique and so on and so forth…. It’s important for me to be very aware of that voice as it tends to team with my aches and pains against me. Usually I can recognise what it’s doing and focus on my technique or something positive until it pulls itself into line. Last night, though, there was no tricking it. But you know what? It may not have been the best session I’ve ever done, but I finished the set. I think you shouldn’t let it become a habit, but sometimes you just need to accept that you’re going to have off days, and give yourself a smidgeon of a break. The habit of going anyway and doing as much as you can means that one bad day doesn’t stop you and skipping one session doesn’t lead to skipping another and another…. And that leaves you wide open for the good days!